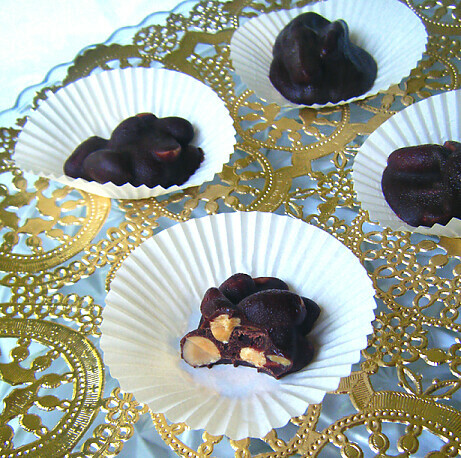 Healthy Peanut Butter Cups – Homemade Treats that are Low Carb, Primal, and Nearly Sugar-Free! 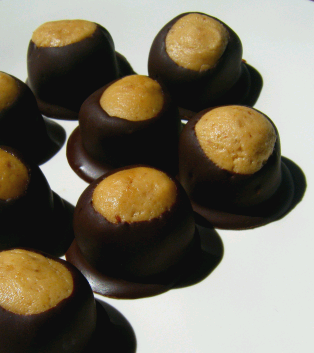 This healthy version of everyone’s favorite peanut buttery candy is quick and easy to make. Check ’em out! This is going to be the first in a series of quick and easy desserts that can be made with primal (or paleolithic diet-friendly) ingredients. I’ll include a low carb (sometimes sugar-free) version for each of these recipes as well, of course. 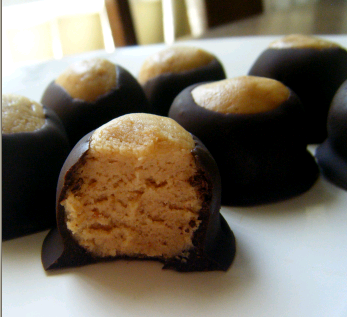 Here’s a sweet treat for you peanut butter lovers out there! If you are allergic to everyone’s favorite legumes, try substituting in smooth almond butter for a nutty flavor. Try sprinkling chopped peanuts on top (instead of the sliced almonds pictured here). I improvised with what I had on hand. 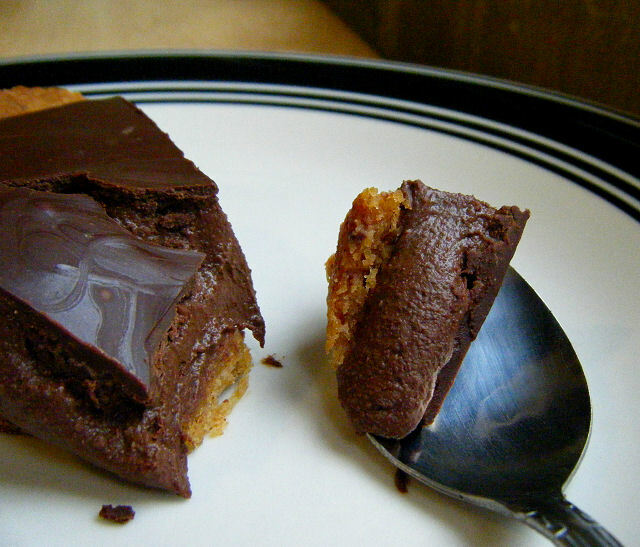 Chocolate & Peanut Butter, a match made in Heaven. As good little Weston Price followin’ sugar hatin’ unprocessed foodies, we have to get our peanut butter cup flavor fixes the homespun route. We must conjure up low carb alternatives with nut flours, healthful saturated fats, sugar substitutes, and pure unadulterated cacao. Our desserts don’t come easy and don’t come cheap. There’s no vending machine button for this stuff. But the payoff for some serious kitchen time is so worth it. So sorry to keep y’all in suspense about this low carb, sugar-free, gluten-free and dairy-free (whew!) 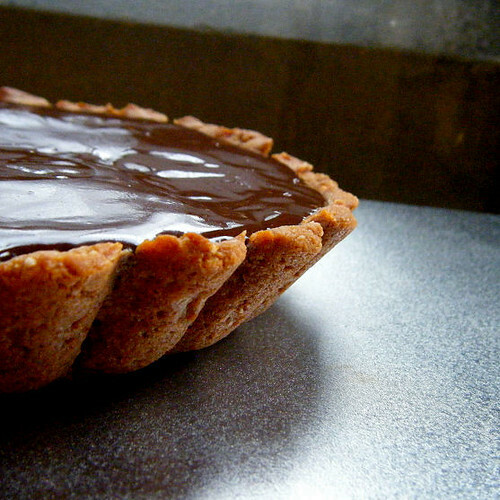 Chocolate Peanut Butter Tart recipe. The photo for my initial test run is apparently the most popular image at my flickr album. I was just tweaking the recipe to provide a couple of options for ingredients. After some tinkering, I hit upon two different fillings with slightly different consistencies, only one of which requires xanthan gum. Xanthan gum acts as a no carb replacement for the cornstarch used in typical pudding recipes. It is a specialty ingredient that I’ve blogged about before. Xanthan gum costs around $13 for a small bag that will last you for years if you’re a low carber (not a high starch gluten-free baker!). There are many applications of this natural gum thickener, some of which include thickening your low carb smoothies to a luxurious “milkshake” consistency, and making cranberry sauce. It’s an innocuous ingredient with a strange name. Just a tiny pinch goes a long way! Now let’s talk dessert! 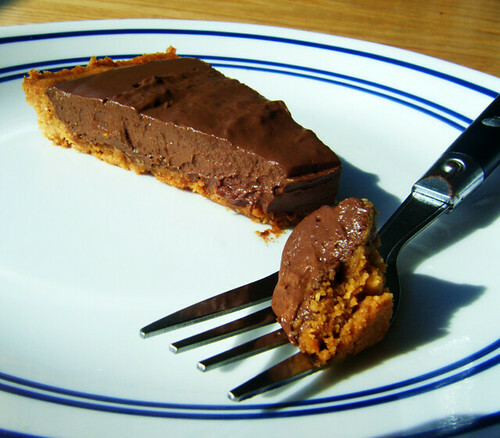 The recipe I made the first time yields a more loose “pudding” tart, with a light tasting lower fat filling. It makes a dainty pudding pie, with a creamy texture and crunchy crust (which could be doubled for more peanut buttery goodness). 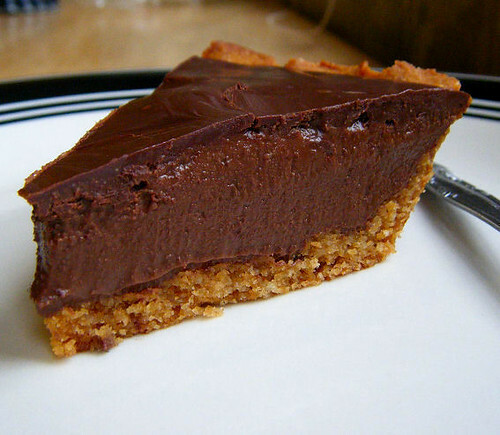 The Chocolate Pudding Tart is what you see in the following photograph. To make either of the recipes completely sugar-free, use xylitol in place of honey if you can tolerate it. I can handle xylitol in normal portions (one cookie, one piece of pie, etc. ), but had to ingest it regularly for a few days to “adjust” to it. 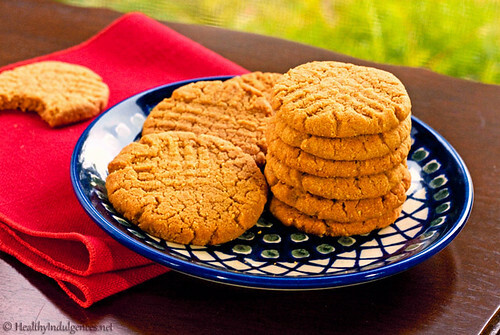 Xylitol works much better than erythritol in cookie-type recipes that do not contain much moisture. How you count the carbs in xylitol is up to you. Some people count half, because it does not have a glycemic index of zero like erythritol. I buy xylitol locally at Whole Foods (instead of ordering it) for convenience. It retails for a better price than erythritol, so per pound it is the same price as ordering online (unless you buy in bulk). Xylitol is a great stand in for erythritol in a pinch if you need your sweet “fix”! Melt shortening or butter in a microwaveable bowl. Whisk in honey and stevia extract. Grind peanuts in a food processor or Magic Bullet, until you get as fine a meal as possible. The peanuts should be the consistency of a crumbly paste. Add peanut paste, baking powder, and vanilla, stirring it together with a spatula until you have a smooth dough. 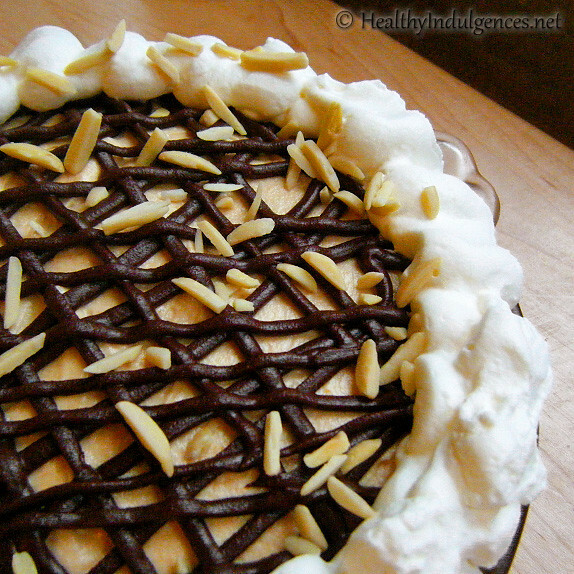 Press into a greased 9 inch pie plate lined with parchment paper. Bake for 15-20 minutes at 275 degrees, or until browned around the edges. 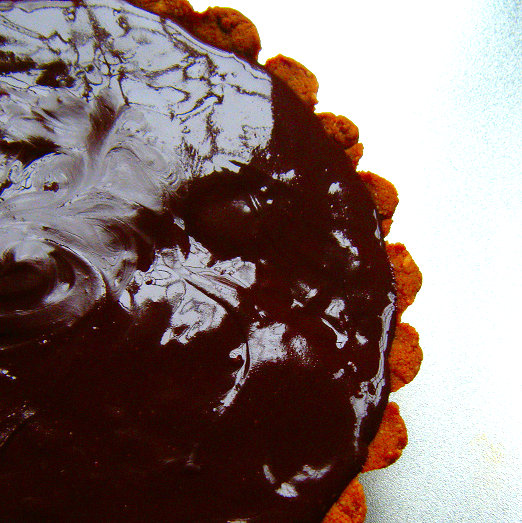 Leave crust in oven and turn off the heat while you prepare the chocolate and start heating the coconut milk. 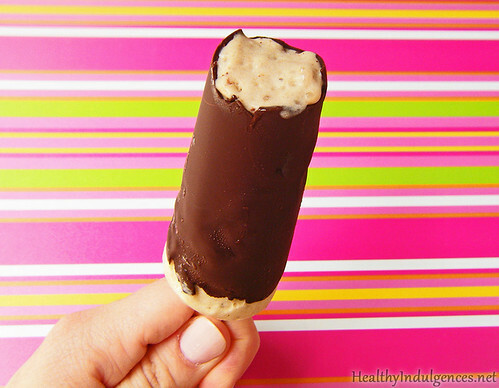 Chop the unsweetened chocolate bar finely. In a sauce pan over medium low heat, whisk coconut milk, erythritol or honey, and sea salt until mixture bubbles around the edges. Remove tart crust from oven and place in freezer to cool. In a separate bowl, stream 1/3 cup reserved coconut milk into cocoa powder, whisking to form a paste. Continue whisking while adding egg yolks to cocoa paste mixture. Measure out 1/2 cup of hot coconut milk from saucepan and stream into cocoa paste yolk mixture, whisking. Turn down heat to low and slowly pour the cocoa paste yolk mixture into saucepan, continuing to whisk. Cook for about three minutes, stirring continuously, until mixture thickens and coats the back of a spoon (to see what this looks like click HERE). Your finger should leave a trail if you drag it across the coated spoon. Remove immediately from heat and add shortening (or butter), vanilla extract, xanthan gum, and stevia. Pour through a fine mesh sieve (I use a regular wire strainer) on to chopped chocolate, and whisk just until the filling is smooth and glossy. Blend in a blender for an ultra smooth consistency. Pour into baked tart crust. Transfer to refrigerator and cover with a paper towel covered with aluminum foil, careful not to let the paper towel touch the top (I pull it tightly over top and secure the covering with more plastic wrap). Chill overnight. Below is the more decadent Chocolate “Silk” Pie filling, topped with a layer of sugar-free Peanut Butter Chocolate Ganache! It makes a larger, more impressive tart. 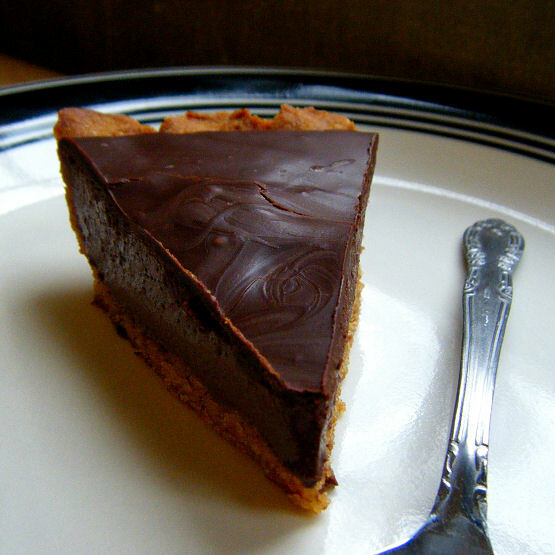 The crust is less sweet and a bit cakey, which balances out the intensity of the rich chocolate. I’ll be making this version from now on, just because of how utterly satisfying it is. A tiny slice is all you need to feel like you’re being naughty! With desserts like these, who needs sugar? For an extra smooth silk pie filling, blend the filling in a food processor or blender after you stir in the chocolate. Preheat oven to 325 degrees Fahrenheit. Melt peanut butter together with butter in a heat proof bowl. Stir in vanilla, egg, and honey or xylitol, if using. Add dry ingredients and stir to form a dough. It may be sticky, but will come together. Press up the sides of a 9 inch tart pan or pie plate, greased and lined with a circle of parchment paper. If you’re making the crust with honey, turn down oven to 275 degrees, and place tart on middle rack. Bake for 20 minutes. Turn off oven and do not open the door. Chop the chocolate and set your coconut milk heating. If you’re making the crust with xylitol, bake at 325 degrees for 15-20 minutes, or until slightly browned around the edges. Heat 1 1/4 cup coconut milk, erythritol or honey, and salt, and simmer on low. Whisk together rest of coconut milk, and cocoa powder. In a separate bowl, whisk together the egg until foamy. Stream 1/2 cup of the warmed coconut milk mixture from the saucepan to the eggs, whisking constantly, and then add egg mixture into saucepan. Keep whisking! Cook for 3-5 minutes over medium-low heat, stirring until mixture coats the back of a spoon (see above instructions for visual). Immediately remove pan from heat, and stir in vanilla, shortening (or butter), and stevia extract. Once butter has melted, strain mixture through a fine mesh sieve on to chopped chocolate. Stir until filling is a smooth, glossy consistency. Blend in a blender, briefly, for an ultra smooth consistency. Pour filling into tart shell, almost to the brim. You might have some filling left over, which you can pour into muffin cups and freeze for snacks. Cool tart uncovered in the freezer until the top becomes firm, then transfer to refrigerator and cover with parchment paper and plastic wrap. Store pie slices in an airtight container to keep the filling moist. Before serving, top filling with this smooth, candy inspired dairy-free topper if you’d like an alternative to real whipped cream. Make this. It’s the BEST part of the pie! Powder erythritol in coffee grinder or Magic Bullet for about a minute until finely ground. Lettle settle in container for a minute or two. 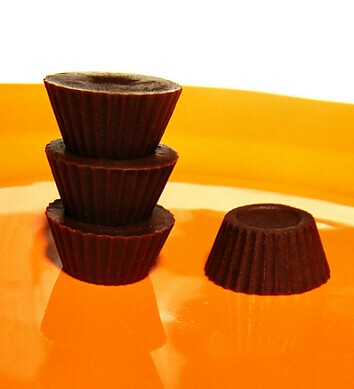 Melt chocolate, peanut butter, and butter in microwave on HIGH for 35 seconds, stirring until completely melted. Melt for 10 more seconds if necessary. 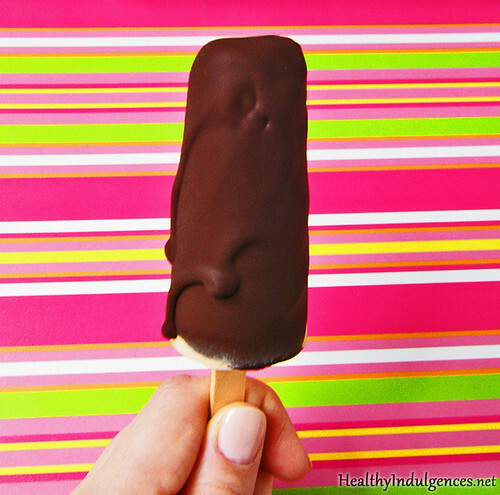 Stir in erythritol and stevia with a spatula, smoothing out the chocolate until it is glossy and lump-free. Spread on to tart. Let topping set in the refrigerator, and cover tart again for storage. 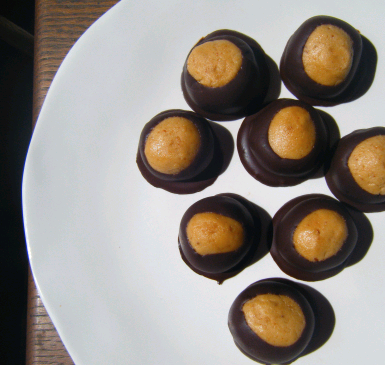 Sugar-Free Buckeyes, how I love you so! To celebrate the season, I’m giving away two prizes to two readers who comment on this post. 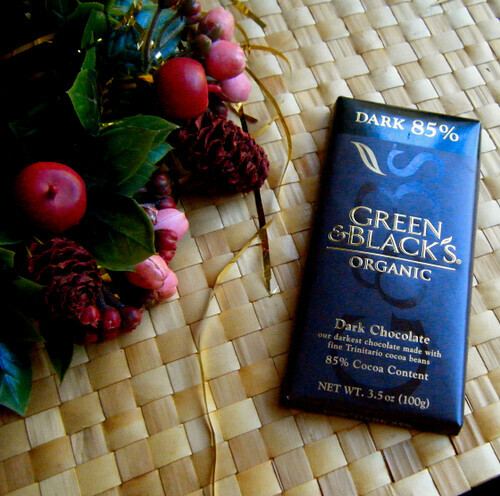 Up for grabs is a package of Green & Black’s Organic 85% cacao chocolate along with my cooking chocolate of choice, the Lindt Excellence 85% cacao bar. I have two of these bundles all wrapped up for the lucky readers! Contest closes December 25th. The contest is closed. Thank you for your entry! I’m taking a break from my regularly scheduled homework to bring you one of those easy snacks you can throw together on a whim. There will be a few of these coming up since play time is limited lately, with classes and homework superseding kitchen experimentation! My skillet and my spatula are my weapons of choice for go-to quick meals–flavored yogurt for breakfast, and stir fries for lunch and dinner. Even using grass-fed beef and organic produce from Whole Foods, it’s much more budget friendly to prepare your meals from scratch instead of subsisting on campus fare. Not to mention the limited availability of gluten-free low carb meals here. Everything is served with a piece of bread! Back to the topic at hand. You can combine almost anything with plain yogurt and a little vanilla extract to make your own custom flavors, which can get rather addictive once you stock your pantry with extracts and spices. Get creative and add nuts, nut butters, blackstrap molasses, cocoa, toasted coconut flakes, flax meal, coconut oil, lemon juice and zest… whatever you want, ’cause it’ll probably taste good in the rich, full fat yogurt we, as low-carbers, can indulge in without guilt! I’ve been (finally) getting into fall with pumpkin pie yogurt. All you need is a scoop of canned pumpkin, a few drops of vanilla extract, and a big pinch of pumpkin pie spice to enjoy this wonderful holiday dessert for breakfast. I’ll throw it in tupperware and eat my yogurt during morning lecture, garnering more than a few strange looks as I dig into my orange goo! If you like peanut butter honey sandwiches, or apples and peanut butter, you’re gonna flip for this. We’re revisiting those chayote apples that I used in my apple crisp, this time cooking them up quickly in a skillet with no added spices. Still incredibly apple-y (even if you use lime juice because you’re out of lemon juice like I was for this photo shoot!). The chayote’s texture mimics the apple’s crispness, paired with the perfect level of tartness and sweetness from the citrus juice and stevia. Use as much or as little honey as your needs allow, keeping in mind that honey is 6 grams of carbs per teaspoon. Buy as dark a honey as you can find for the most flavor. I buy local raw honey from the bulk section at Whole Foods, filling the plastic tub with as much or as little of the sticky stuff as I need. One teaspoon is all it takes to satisfy my taste for honey, which goes back to Sunday morning breakfasts consisting of fried eggs (over hard! ), Brown n’ Serve sausages, and English muffins slathered in honey that I squeezed greedily from the plastic bear. Yes, you can have honey on a lifestyle that is sugar-free 99% of the time. If honey is a flavor you miss, incorporate a tiny amount into your daily diet and find out if this little bit of real sugar kicks up cravings for sweets. And peanut butter makes everything better. Now get mixing! Chayote, before after being turned into sugar-free apple-y goodness! 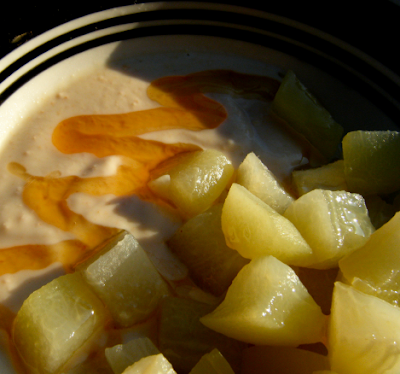 Stir together yogurt, peanut butter, and honey**. Add a pinch of stevia extract and taste for sweetness. Add more stevia if necessary. Place a non-stick skillet over medium heat. Wash and peel chayote, rinsing off the sap under the faucet. Split down the middle with a knife (cutting through the “crack”), and pry out soft seed. Cut chayote into chunks. Mix together water, lemon juice, and stevia. 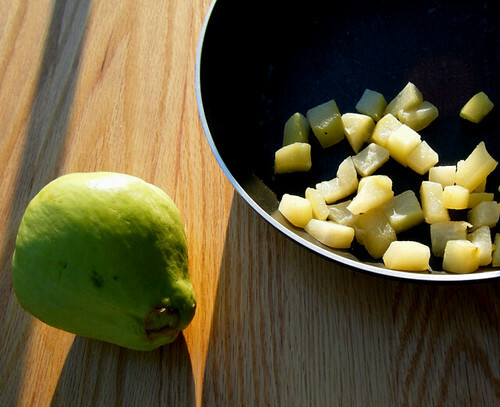 Once pan is hot, add chopped chayotes and lemon juice mixture, stirring a bit to coat the chayote pieces. Cook, covered, for 10 minutes, shaking the skillet around once during cooking to redistribute the chayote pieces. You want to cook it until it is fork tender and the water has just evaporated. Uncover and remove from heat. 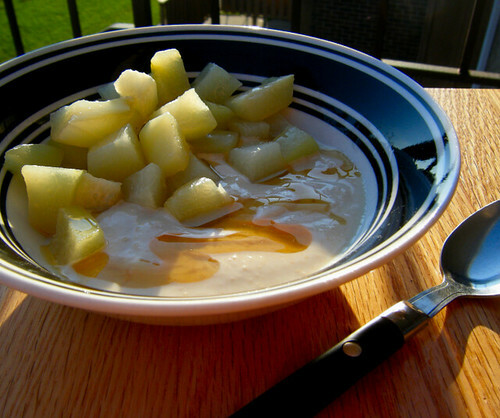 Let cool and serve with yogurt, or toss in melted butter and cinnamon for fried apples. Can also be pureed for applesauce! **You can also leave the honey out until serving time and just drizzle it on top for a pretty effect, stirring it in before you eat. It’s a toasty 92 degrees outside in southwest Florida, so I’m not in the mood to heat up the kitchen. Been digging cold foods lately. To fulfill this need, I bring you Tyler Florence’s Cold Sesame Noodles, with a few tweaks to make it diabetic-friendly and gluten-free, of course. It incorporates my obsession with peanut butter into a savory dish, and is a delicious way to get in your daily veggies. So what if you’re impatient like I am, and just can’t wait for whatever you’re cooking to cool down because it smells ridiculously good? 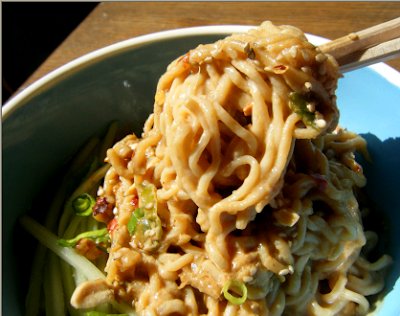 Fear not my impulsive friend, because these flavorful noodles are amazing served hot as well. I enjoy them most after they’ve been chilling in the fridge, though. Gotta give time for the flavors to meld, baby! To make over this dish, we gotta ditch the sugar and standard noodle varieties, which pack a carby punch. This feat is simpler than it sounds! You can make zucchini noodles (“zoodles”) with this nifty spiral slicer and some zucchini or summer squash. The alternative is a new product called shirataki noodles. They’re nothing short of miraculous! They contain only 2 grams net carbs per 8 ounce package if you can believe it! The only caveat is their chewiness, which I don’t mind, but a couple of my pasta-loving testers called it out. I guess when you haven’t had noodles in a year, you take what you can get! Another note about this recipe is that it makes a ton of the peanut dressing, so I reserved about one third of it for later use. This sweet and spicy sauce would be delicious with some chicken or a crisp salad. It’s seriously good enough to drink. 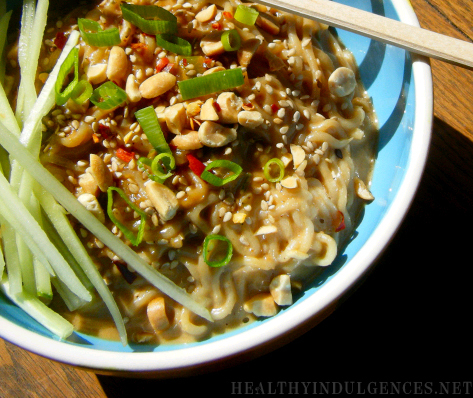 If you are using shirataki noodles, empty out both packages into a colander. Rinse for 1-2 minutes, until there is no lingering fishy smell. Line colander in paper towel and mix a few big pinches of sea salt in with the noodles, stirring them around to coat. Drain for 30 minutes. Rinse again and dry well. Heat sesame oil in a skillet over medium-low heat. Stir noodles around skillet for a couple of minutes, until they start to release some moisture. Transfer noodles to a plate or a bowl. If you are using zucchini, use a spiral slicer to julienne into noodles. Salt zucchini liberally, then transfer to a paper towel-lined colander. Let sit for 30 minutes to draw some of the moisture from it. Rinse well and gently squeeze dry with a paper towel. Heat sesame oil in skillet over medium low heat. Add zucchini and carrots to skillet and stir it all around for 1-2 minutes, until heated through and a bit more tender. Just barely cook the veggies. You don’t want them soft and mushy! Transfer to a plate or bowl. Mince up ginger, green onions, and garlic cloves. Whisk sweeteners, peanut butter, vinegar, soy sauce, and hot water together until sweeteners are dissolved and a smooth sauce is formed. In a skillet, heat the macadamia nut oil over medium-low heat. Add the minced mixture along with the red pepper flakes and cook for 3 minutes, or until fragrant and softened. 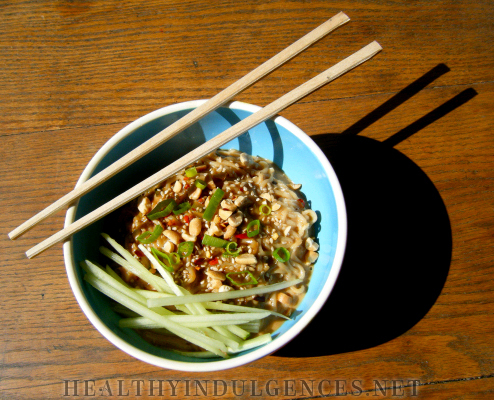 Add peanut sauce to skillet and cook for one minute. Add noodles or zucchini to pan, and remove pan from the heat. Stir well to coat, adding half the sesame seeds if desired. Serve at room temperature or refrigerate for later use. Garnish with the rest of the sesame seeds, julienned cucumber, red pepper flakes, and chopped peanuts if desired. A peanut butter-y main course must be followed up with an equally peanut butter-y dessert! Any Ohio State fans out there? 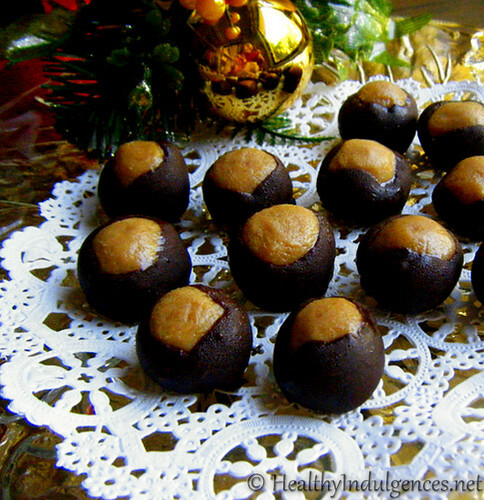 I never realized that Buckeyes were associated with anything other than Christmas until Google enlightened me. 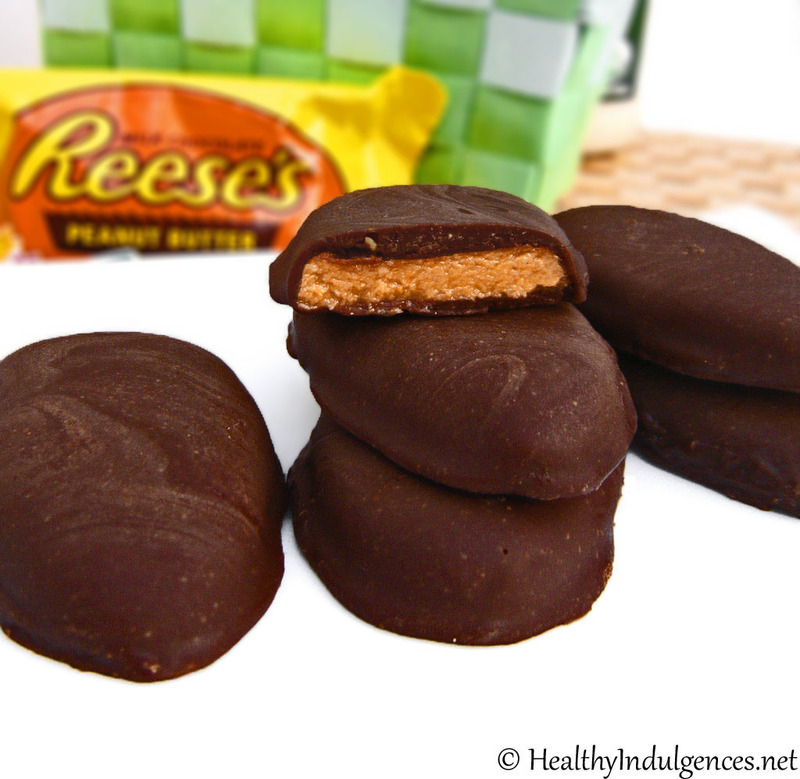 Whatever these addictive candies mean to you, they rock, with a smooth and sweet peanut butter filling coated in rich chocolate. To replace the copious amounts of powdered sugar in the traditional recipe, I used a couple of surprising ingredients–ricotta cheese and coconut flour. I promise they don’t taste like cheese or coconuts. They’re basically a party in your mouth. Make a small batch if you like PB as much as I do! So I had to sample a few before the photo. Had to make sure the recipe was just right! Peanut butter is a substance that makes me dangerous. Chillin’ in the fridge, accessible by spoon and finger, it’s in mortal peril every minute. To avoid this internal struggle, I only purchase jars of this spreadable bliss for immediate consumption in recipes. This post is dedicated to George Carver. Fortunately, this nirvana-in-a-jar is healthy and relatively low in carbohydrates, containing 4g net carbs per 2 tablespoons. That’s a good-sized portion for its satiety factor. It’s a good source of biotin, vitamin e, and antioxidant polyphenols (heart-healthy compounds that fight free radicals). It also contains a small amount of resveratrol, the anti-aging component of red wine. Who knew? Be happy and combat wrinkles with PB (taken internally, not topically)! Start your day in a good mood with a big dose of PB! This version of my grain-free (no oats here!) 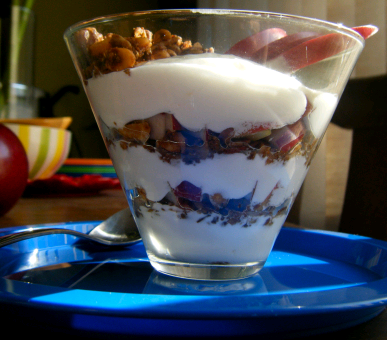 granola is heavenly with a rich peanut butter-y taste and smell. It’s a very flexible recipe, so if you don’t have some of the nuts and seeds listed, fear not! Just throw whatever you have in there and it’ll come out crunchy and roasted with a sweet coating. Pair it with sliced apples and yogurt for the perfect flavoring combination. I’m thinking peanut butter granola in almond milk with a few teensy slices of banana (1/4 of a large one) for a decadent pre-workout breakfast. 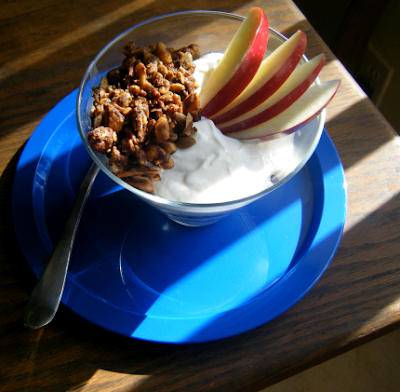 It’d also be pretty kickass making sweet love to my chocolate granola in the same bowl. Reese’s cups cereal, anyone? Melt butter or oil with peanut butter in a small bowl in microwave until liquified. Powder erythritol in a coffee grinder or blender. 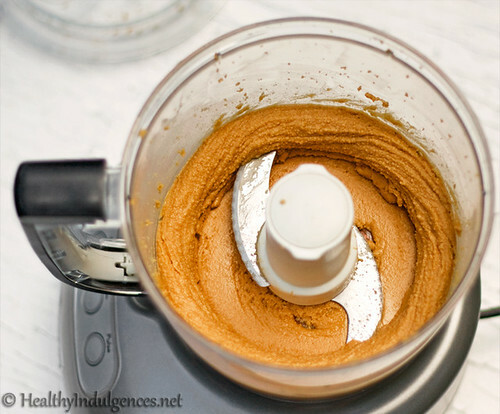 Whisk erythritol, blackstrap molasses, additional sweeteners, and sea salt into peanut butter mixture. Mix dry ingredients together and stir in wet ingredients, using your hands to coat the nut and seed blend. Spread mixture over a parchment paper-lined baking pan. Bake for 45 minutes, stirring the mixture around occasionally. 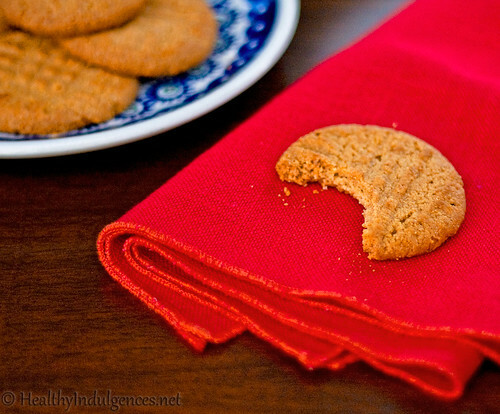 Remove from oven and spread over a paper towel set on a baking rack. It will continue to dry out as the moisture evaporates. Bake granola for an extra 10 minutes if the mixture still seems moist after cooling. Store in an airtight container for up to a week, or freeze.